Tactile printing is the process of adding a raised surface to a substrate, creating a texture that can be sensed with touch. Watermarx Graphics has been using our CLIQX emboss technology to create tactile results on all kinds of substrates, from paper and cardstock to poly-plastics. Braille is an important element of pharmaceutical and medical packaging, and its application is expanding every day! We work with pharmaceutical and medical companies to help add Braille to packaging. Latest reports say the demand for this added feature will continue to grow. What’s great about this is what is driving the boom. The demand for Braille is because of the growth in job opportunities for visually impaired people. More than ever before, individuals living with the challenge of blindness or low vision are being employed in marketing, business management and administration, human services, health science, and agriculture sectors. There is also an ever-growing demand for Braille in educational and marketing materials, as our social awareness increases. Watermarx is here to help support that need in a cost-effective way. This is more than just a trend in print, it’s a trend in human rights, equal opportunity and access… and we’re thrilled to play our small part in it. CLIQX is a totally affordable technology that can texture stocks and bump-out labels for a cost-effective Braille solution. Our sharply defined emboss is also great for tactile graphics. It definitely should also be considered as an option in the face of this growing demand for tactile print. Braille was developed in response to Napoleon’s demand for soldiers to communicate silently at night, without a light source. In 1824, Louis Braille was a 15-year-old student at the Royal Institute for Blind Youth, in Paris. He was the one who invented the tactile alphabet that is now known by his name. You can find out more about Braille in Australia and the requirements for compliance from the Australian Institute of Braille. 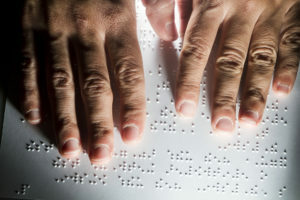 If you are interested in finding ways to print Braille or applying textures to paper surfaces, give us a ring! We would be more than happy to talk through the tactile printing solutions we can provide for your project. You might find the experience… illuminating. This entry was posted on Monday, July 16th, 2018 at 4:03 pm	and is filed under Watermarx. You can follow any responses to this entry through the RSS 2.0 feed. Both comments and pings are currently closed.